This 28th edition of the Men’s Open division starred 10 teams from across the continent. In the First Round, the winless Montreal Kaitas A faced the Toronto Blazers. It appeared that Montreal would be headed home with a winless record, as they trailed 19-15 at the break. Montreal’s shots weren’t falling and the Blazers were far ahead in the rebound count. But after they changed baskets, Montreal started to do their thing. After a terrible first half from their starting backcourt where they each went for zilch, Jason Rodney and Keith Cayanong teamed up for 17 second half points, and the Kaitas advanced to the Quarters 47-29. The other game of the round was a game between the Toronto Dragons B and the NY Crossbearers A. NY’s unsung PG David Zheng (13 pts, 2-3 ft) did a stellar job in stopping the highly regarded Dragons guard Alex Liang (0 pts, 4 fouls), while human acrobat James Li dropped in 6 clutch points to go along with 3 steals. The final score was 37-28, NY. Kelvin Cheung (11 pts, 4-5 ft) and Jeremy Soon Shiong (14 pts, 2 triples, 1 assist) paced Toronto. In the Quarters, the Toronto Titans faced off with the Montreal Kaitas A. Toronto was one of the pre-tournament favorites, having one of the most powerful lineups in the Open. They seemed like a lock to make the Final Four this year, and it certainly seemed that the predictions would hold true as the Titans fed the ball to 6 foot 9 Goliath center James Chen (14 pts, 3 blocks) early and often. James got Montreal’s stud big man Ken Hsiung in foul trouble as Toronto was having their way with the Kaitas. In the second half, Montreal’s guards arose from the dead, as Keith Cayanong (18 pts, 5-5 ft, 3 rebounds) and Jason Rodney (25 pts, 8-9 ft) played their hearts out to give Montreal one of the biggest upsets of the Tourney 53-49. Carlos Andrade tallied 11 and 7,while Billy Hui also had a good game for the Titants, dropping in 9. Up next was a game between the undefeated Toronto Kagers and the tenacious NY Rockits U. The game never materialized into a big contest, as the Kagers missed everything and scored only 6 first half points. After digging themselves a deep home, Toronto could not escape. Their leading scorer Germain Wan struggled to a sickening performance, registering only 3 points. The Rockits were sent to the line throughout the second half and hit 11-13 in the second half to advance 33-21. 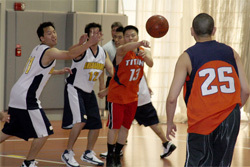 Tim Chin led the Rockits with 9 points. 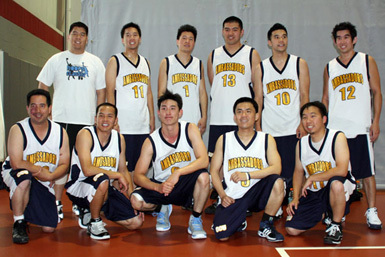 The following QF game was the veteran Philadelphia Suns Alumni, and the NY Crossbearers A. The game looked to be a good matchup on paper for both undersized teams, and it stayed competitive throughout although the Crossbearers were up 3-7 points the whole way. Towards the end, NY stretched their lead on free throws and took the W 49-37. David Wong (14 pts) and Michael Chan (All-Tournament, 14 pts, 2 treys) led NY, while Hoi Lam (3 triples, 3 steals) and Ky Cao (10 pts, 5 rebs) were the high men for the Suns. The last game of the round was SF CCU and Washington CYC B. It was a 2 man game for Frisco, as Jeremy Lee (25 pts, four 3’s) and Aaron Tom (12 pts, 0-3 ft) did it all. After doubling up on CYC 28-14 at the midpoint, DC was too far behind to catch up. Rookie G Caleb Lui had 15 second half points for CYC B, but SF CCU moved on to Monday with a convincing 52-39 win. In Monday morning, the first game of the Final Four was the Montreal Kaitas A v/s the NY Rockits U. Montreal simply played better defense in this game and hit the boards harder, outrebounding NY 34-27. Top players for the Kaitas were Ken Hsiung (9 pts, 11 rebounds) and Andrew Huang(7 pts, 1-2 ft). Michael Louie kept the Rockits in the mix, hitting 4 three-pointers en route to 13 points. Montreal moved on to the Finals 38-34. The next Semi was the NY Crossbearers and SF CCU. James Li (14 pts, 2 triples) was looking to put the Crossbearers on his back, scoring 10 in the first half to give NY a 20-15 edge. The Crossbearers were using solid team defense to keep Jeremy Lee (8 pts) from getting the ball in his sweet spots and it seemed NY may have been headed to the Chip. But San Fran was able to keep it close to allow Jeremy Lee sank a jumper and Aaron Tom (11 pts, 6 rebs) to score on an inside move to come from behind and win 33-31. In the Championship, CCU was able to capture the lead with 9:52 to go in the first half and never trailed after that. The margin remained close throughout, but SF was always up and Montreal could never get going on a run. Montreal got within a point with about 8 minutes to play in the second half, but after a follow up by Aaron Tom and Jeremy Lee’s 2 ft’s SF was up 30-25 with 6 and half minutes. It looked as if Montreal was a goner, but Ken Hsiung scored on a putback and had a humongous rejection moments later at the other end. Trailing 37-35 with only 50 seconds left to play, Montreal needed to put SF on the stripe and CCU hit what they needed and won 41-35. MVP was Jeremy Lee (22 pts, 9-10 ft, 6 reb, 4 assists). Jason Rodney led Montreal with 16 points and 2 steals. Kudos to Wyman and the CCU organization for all their success this year. It was great to see a team with such fabulous sportsmanship succeed when it counted.